With knitting and crochet patterns, the nautical trend is something that never seems to go out of fashion. Predominantly centred around Breton striped designs, it's a look that's particularly stylish in the warmer months as it conjures up a feeling of days spent by the seaside. Whether you're looking to shake your own wardrobe or a loved-one's, or simply fancy sprucing up your interiors, we have a number of knitting and crochet patterns you'll love in our online store. Let our pick of the best nautical trend pieces inspire you to get creative. This polo shirt with a smart collar and skinny horizontal stripes is the ideal knitting pattern to get to work on right now. Pair with jeans and pumps for a lovely laid-back look. Layer this classic cardigan over a plain dress or use to bring a style statement to a simple skirt. You don't just have to show your appreciation for the nautical trend through your outfit choices. 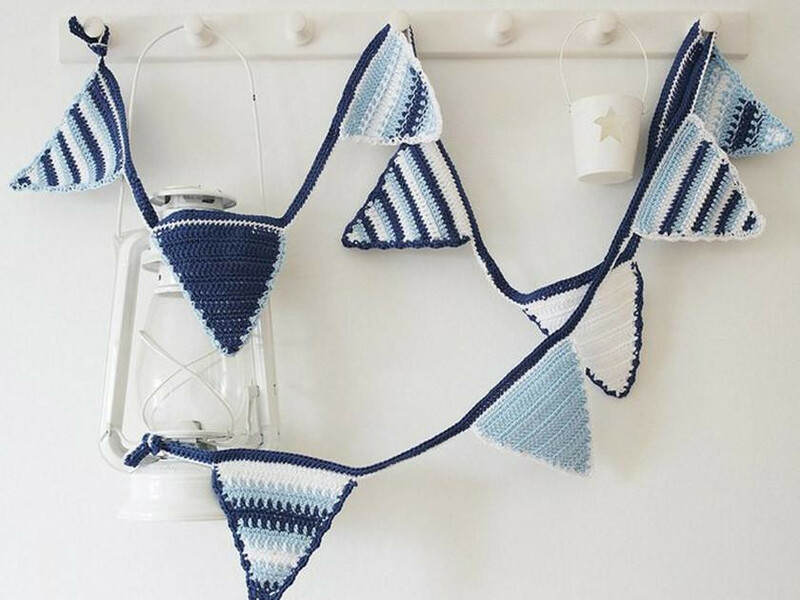 Crochet this striped string of bunting and see how a touch of blue and white can bring a chic coastal feel to your home. Once you're finishing crocheting, your string of bunting will measure approximately 223cm long. Store homemade preserves in style in a glass pot topped with one of sweet jam jar covers. If you're stuck for a present to give to a friend, these would be sure to go down well. Ahoy there! Little ones will adore playing with this cheeky knitted dolly. Reworked from a knitting pattern first featured in a 1953 issue of Woman's Weekly, he'll certainly add charm to any box of toys. This braided cord doorstop will inject a subtle touch of the nautical trend to any room in your house. The cables add texture, while a plastic-covered brick on the inside will ensure your doors are propped open effectively. Bright red yarn is perfect for the body of this knitted tunic that can be worn by both girls and boys.